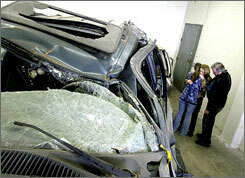 Plaintiffs personal injury lawyers across the nation are resisting the urge to say “I told you so” after the recent study by the Insurance Institute for Highway Safety (IIHS) confirms what we have been saying all along: if SUV manufacturers would simply make the roofs of SUV’s stronger, it would save lives. The study concludes that more than 200 deaths could have been prevented in rollovers in 2006 if just a few more SUVs had roofs as strong as the best one it tested, and, of course, it follows that thousands of serious personal injuries, likewise, could have been prevented. The IIHS study is extremely important because it proves what plaintiffs’ lawyers have been saying all along; that inadequate roof strength can be the cause of death of an occupant in an SUV during a rollover. That an SUV will, in fact, experience a rollover is a given, and manufacturers are supposed to design and plan for that occurrence. The study is also important because it exposes the National Highway Traffic Safety Administration (NHTSA) for what it is, a co-conspirator with automobile manufacturers to require only the most minimal of “standards,” (if they can even be called that) so that automobile manufacturers can continue to make hundred of millions of dollars on the backs of American citizens without reasonable attention to safety. Automobile manufacturers for years have defended against such cases by claiming to have complied with the NHTSA “standards,” but this study shows such compliance is mere window dressing, and really meaningless when it comes to actual occupant safety. Much research has been done that shows for less than $100.00 per car a manufacturer could double the strength of the roof regarding strength to weight ratio. It is unfortunate that American car companies care more about their bottom line than their customers’ safety.